When we went on our Disney World trip last year, I knew we would need a stroller. Our son was about to turn 5 and we knew a stroller would make the trip easier. I was determined to find the best lightweight stroller for a 5 year old to take on our Disney trip that was more durable than the typical umbrella stroller. I spent a lot of time researching the best stroller for 5 year old Disney and I hope this is helpful for others doing the same! If you’re in a hurry, below are the “winners”, but in my review I go through all of the features that I was looking for and what worked best for us at Disney. 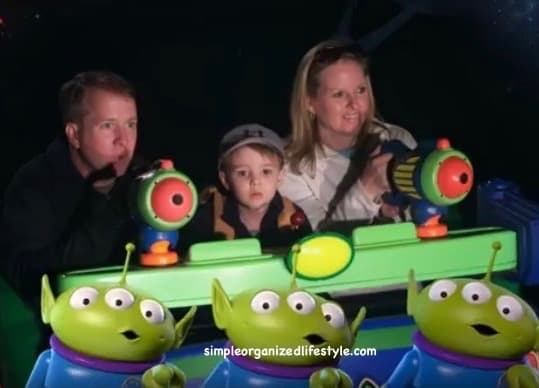 Our goal for taking a stroller to Disney even though our son was older was to keep him calm. Hands down, that was our number one goal! He has always handled new situations much better in a stroller because it helps to reduce the anxiety from sensory overwhelm. As an added bonus, it would hold our bags and speed up the process of getting from one place to another. Tip: If your child has sensory processing disorder, you can request a special tag at guest services that allows the stroller to be used in lines and restaurants. I’m happy to say we found one that fit all of the criteria and worked out great! I’m writing about it here to help another mom or dad who is looking for a similar stroller for an older child at Disney. We took our own stroller instead of using the rentals at Disney because of cost and convenience. We wanted something smaller than the rentals and something our son could become used to at home before our trip. The rentals also mean taking a risk that you get stuck with the “bad buggy” that we’ve all had happen in the store. If we had rented a stroller with a squeaky sound or messed up wheel, it would have frustrated our son the whole time (and us too)! The stroller we ended up with was a just right weight at 14 pounds. I’ve seen parents with the mega strollers at Disney and they looked stressed out trying to get them on the buses and through the crowds. Also, they ended up full of more stuff, which I wanted to avoid. I knew we would have just a few minutes to get a stroller folded when getting on and off the buses. This stroller folds over and has a clasp to keep it closed. It just took two steps and a few seconds. This is our exact stroller in this review video. She shows how easily it folds and locks at 1:15. We took two small backpacks on our trip and it was so nice to have a small storage basket on the stroller to hold the backpacks while we were in the parks. I was amazed at the room in the storage basket for such a small stroller! It also had a drink holder and a zipper storage pouch with two mesh pockets, which was fantastic to hold a few things that we wanted to get to quickly. Instead of bumper to bumper traffic at Disney, stroller to stroller is an accurate description! We wanted a stroller that was easy to turn and maneuver through the crowds. This stroller was very easy to turn all the way around or sideways to get from place to place. I wanted a stroller that came in a color option that would stand out in a crowd. This one came in a bold red and it was really easy keep up with in the sea of strollers after we were done with a ride. Sometimes the Disney workers move the strollers around while you’re in a ride to keep them organized so it could be in a different spot when you get off of a ride! 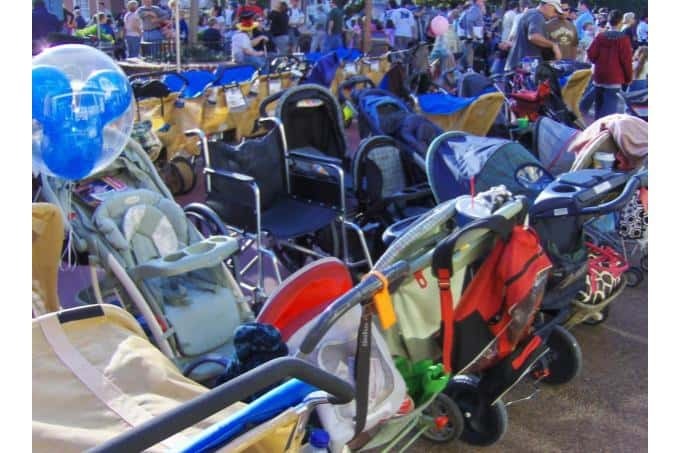 There are a lot of Disney mom hacks for finding a stroller quickly. My favorite ones that are simple to do are to just add a bright piece of duct tape or an LED Armband (glows at night to help) to the handle. Tip: Take glow sticks and light up bracelets from the Dollar store on your Disney trip! We saved up for our Disney trip for a couple of years to take our son at the age of 5. We also strategically used our Disney Visa reward points from making certain purchases and paying off the balance each month. Disney vacations are already expensive so I did not want to spend a lot of money on a stroller that my son would soon outgrow. Our budget for a lightweight stroller was in the $45-60 price range. Florida heat on Disney asphalt= HOT! A little shade from a canopy was enough to protect from the sun and had the added bonus of helping keep the seat dry from an occasional light rain. Although the stroller was lightweight, it was extremely sturdy and durable. The parking brake came in handy to keep it secure in the stroller parking areas. Even though our son is below the average weight for his age, we wanted a stroller that could accommodate up to 50 pounds. Our son was around 33-34 pounds on this trip and the stroller moved around easily. The material on this stroller was quick to dry and easy to wipe down and clean. I had images of my son tiring out and taking quick naps in the stroller so I wanted something with at least a small recline. This stroller had a really simple adjustable strap for a small recline. However, we never got to test it out… his eyes were wide open until his head hit the pillow every night, ha! This is a classic picture that describes most of the trip… I just wanted to have fun, our son just wanted to get back to his stroller, and Mr. SimpOL just wanted to win! Honestly, it’s hard to think of any negatives about this stroller. The foot rest was a little flimsy, but otherwise this stroller met all of our criteria and then some! 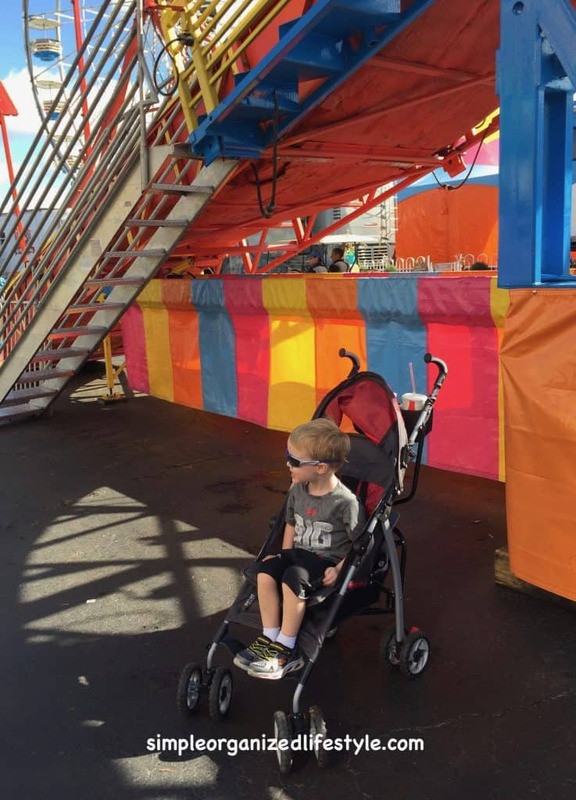 This exact stroller is no longer available just a year later. Bummer. This is pretty typical with baby products but I was hoping it would still be on the market just a little over a year later. I’ve compared the specifications from ours and found three that are very similar in size, features and price. The Kolcraft does not have the same handles, but it does include a removable tray and more basket storage. They all accommodate up to 50 pounds for older children. 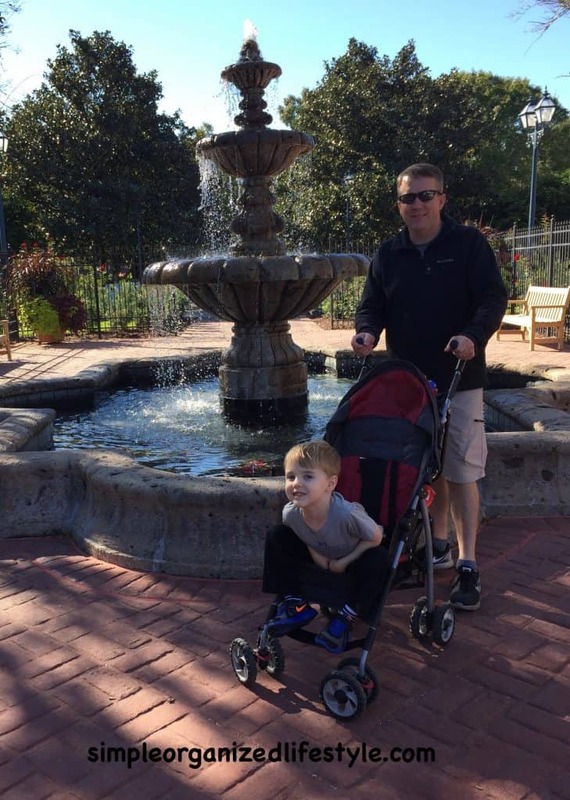 We had a great trip and this stroller was one of the big reasons why! I know without it our son would have been more anxious. Instead, he was able to truly relax and enjoy the sights and sounds of Disney in the stroller. In fact, we had such a good experience using it with our 5 year old at Disney, that we used it several more times after the vacation. We’ve used it at community events like fairs and parades. Any other stroller at Disney advice? Definitely a precious tip! I was looking at the internet what stroller to buy for my 5 years old boy to take to Disney and then I came across with your wonderful text! Thank you so much! Now I know what stroller and where to buy it before I arrived in Orlando. Nevertheless, you also gave tips on how to better find the stroller after a ride, great idea to take glow sticks and light up bracelets from the Dollar store..just love it! Really appreciate it! So glad it was helpful and I hope you have a wonderful trip!